On June 12, 1843, The Rev. Dr. George Burgess and forty families formally organized St. James's church. St. James's was named by Dr. Burgess who reasoned that since the first church in Hartford was named for St. John, his brother, St. James should also be remembered. In 1855 the parish erected and consecrated a red brick church in the Norman style on the west side of Goodman Green in the current town center. Until the turn of the twentieth century, St. James's experienced limited growth. West Hartford in the mid-1800's was a rural community and most of the farmers belonged to the Congregational or Baptist churches. The population initially clustered in the eastern end of the town. 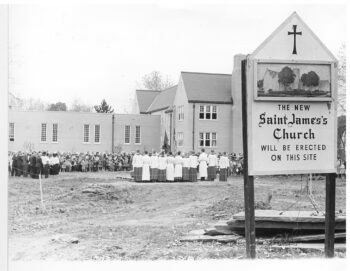 When St. John's moved to that part of town in 1909, most Episcopalians flocked there. St. James's was held together by clergy from Trinity College in Hartford. From 1896 to 1929 finances were difficult and St. James's lived under the wing of St. John's. The Assistant at St. John's, Walter H. Gray, became Vicar to St. James's and led the congregation until April 1931. The Rev. George G. Guiness became the next rector and served the parish for sixteen years. His flair for leadership and intellectual decisiveness helped St. James's to experience rapid growth. This dynamic vitality was sustained by his successor, The Rev. Canon Douglas W. Kennedy who led the parish from 1947 to 1971. By the mid-40's, the congregation outgrew the red brick church. Canon Kennedy began the fulfillment of a three fold building program, the purchase of a rectory in 1949, the building of a parish house in 1954 and the construction of the church in 1962. The Rev. Ronald Woodruff led the parish from 1971-1989 developing a strong commitment to outreach locally and abroad. The mortgage on the church was retired during his tenure. The Rev. John L. C. Mitman began his term in 1990 and embarked on a campaign to update the church and parish house. He retired from parish ministry in 2001 and became the Director of The Society for the Increase of the Ministry. The present rector, The Rev. Robert C. Hooper, III was called to be the sixth Rector of st. James's. He celebrated the Holy Eucharist for the first time at St. James's on Thanksgiving Day of 2002. Four of the clergy who served St. James's became Bishops. The Rev. Burgess a bishop in Maine, The Rev. Arthur Coxe became Bishop of Western New York, The Rev. William Nichols became Bishop of California and the Rev. Walter H. Gray Bishop of Connecticut. The Town of West Hartford was originally a part of Hartford, Settled in 1679. It was incorporated as a separate entity in 1854 and today is a thriving and affluent suburb of the capital city. The most recent census (2004) put the population of West Hartford at 64,225 with a median household income of $66,895. The Connecticut Magazine rated West Hartford second in the entire state for quality of life in towns over 50,000 based on its economy, educational facilities, cost of living, low crime rate, and leisure and cultural offerings. Blue Back Square opened in the center of West Hartford in the Fall of 2007. This new venture provides uniques and convenient shopping, dining and entertainment, an inviting central gathering place, luxury condominiums and rentals and state of the art office space. West Hartford is home to many synagogues, Roman Catholic and Protestant churches. 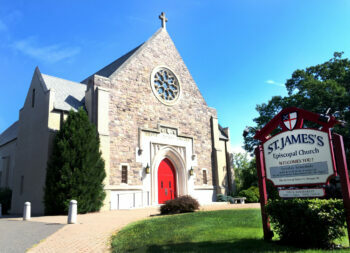 St. James's and St. John's are the two Episcopal parishes in the town and both are on Farmington Avenue.